The Verizon IndyCar series has returned to Watkins Glen for a second consecutive year. 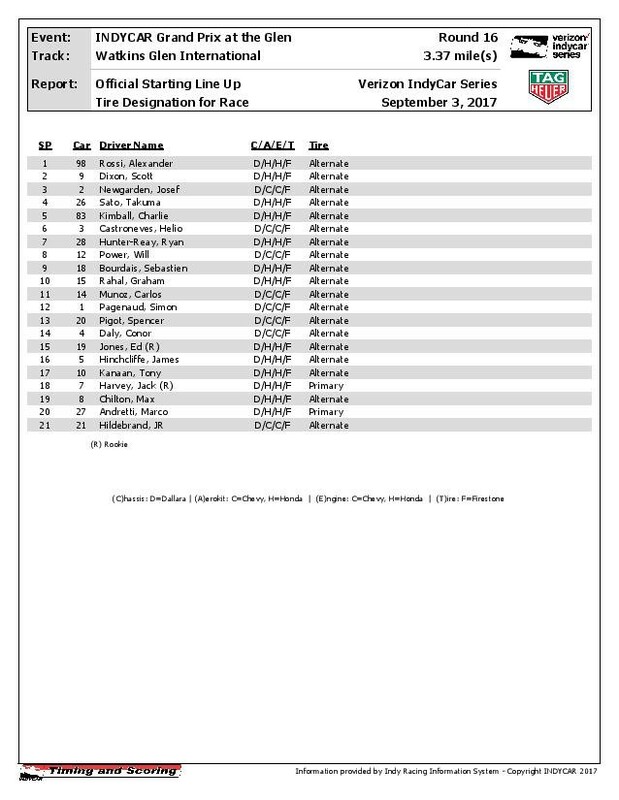 This comes after a five-year hiatus where low attendance and disputes over sanctioning fees caused ISC to pull the race from the IndyCar schedule after a six-year stint that included the late Justin Wilson earning Dale Coyne his first victory in racing competition in 2009. 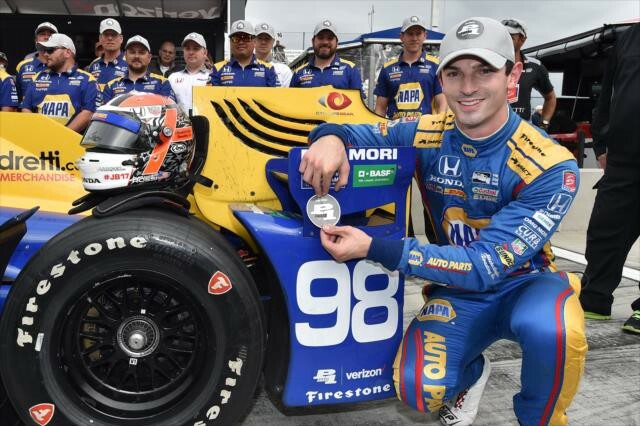 This year sees another first as Andretti Racing’s Alexander Rossi celebrates resigning with the team with his first IndyCar pole win. Rossi narrowly edged defending winner and pole sitter Scott Dixon with a time of 01:22.4639, faster than Dixon’s time of 01:22.5168. Rossi enters Watkins Glen with some momentum with Top 10 starts and finishes in his past four races. “ As you saw most of you on Friday or Thursday or whatever day it was, it is the momentum that’s building. So there’s a lot of positivity amongst the whole team,” said Rossi to the media after winning the pole on Saturday. Rossi has looked great in practices this weekend, finishing second overall with the fastest time of 01:22.6661. He was just under Scott Dixon who clocked a time of 01:22.6187. Charlie Kimball looks to continue with the success he had at The Glen last year. He was in the middle of the field with his top time of 01:23.3871 in practice, however qualifying was a much different story for Kimball. He will enter the race with a career best start of fifth. Last year, Kimball starting started 14th but worked his way to a sixth place finish. “ I feel like I exorcized some demons this year. Pocono last year we crashed in practice. Qualifying wasn’t particularly stellar. Long Beach we missed the top six by two hundredths. To get my first Firestone Fast Six appearance at a road course here at Watkins Glen feels really good. Last year we missed the strategy a little bit. I didn’t get the lap time to get into the top 12 last year. So it feels goods to exorcize those demons, get inside not only the top 12 but also the top 6. Gives me a good starting spot, as you said. If I do the math from 14 to six, then five, doesn’t leave me that much further to go forward,” said Kimball. Helio Castroneves has traditionally qualified well in the past with three pole starts. In what could be his final year in IndyCar, Castroneves will start sixth. With the race being run on a road course, the rain has the possibility of being the great equalizer. Trying to predict the rain is a whole other part of race strategy unique to these courses. “ If it looks like it’s going to dry out during the race, some guys will run a dry setup, thinking for the long game. Once it dries up, you want to have a dry setup on the car. Other guys might gamble on a full wet. Depends on how everyone views the weather situation. Probably will be a mixed bag between a lot of people. That decision can be made pretty late up to the race, probably within an hour, hour and a half, you can still tweak on the car a little bit,” said Josef Newgarden. Points leader Josef Newgarden starts third. A win today would put him in a great position to win the points title in just his second year with Team Penske. He will start just behind Dixon who trails Newgarden by 31 points. It will be interesting to watch those two battle it out. Dixon will need a strong finish to catch Newgarden going into the double points series finale in Sonoma on September 17.